ROI is a popular general purpose metric for evaluating capital purchases, projects, and programs, as well as investments in stock shares and the use of venture capital. ROI metrics compare investment gains directly to investment costs. What is the Return on Investment ROI? The Return on Investment (ROI) metric is a popular method for evaluating the financial consequences of investments and actions. 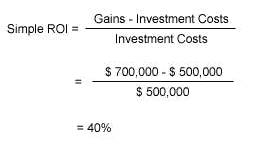 The calculated ROI is a ratio or percentage, comparing net gains to net costs. ROI is popular with financial and non-financial businesspeople alike because ROI provides a direct and easy-to-understand measure of investment profitability. Like other cash flow metrics (NPV, IRR, and payback) ROI takes an Investment view of the cash flow stream that follows from an action. Each of these metrics compares likely returns to likely costs in a unique way and, as a result, each sends a message of its own about the cash flow stream. This family of metrics, therefore, provides several different ways to ask questions like this: Do investment returns justify the costs? Investors and decision-makers use the ROI metric to compare the magnitude and timing of expected gains with the scale and timing of costs. In fact, businesspeople know several different metrics as "return on investment" or ROI, but usually the term refers to the cash flow metric appearing here as Simple ROI or the Return on Investment Ratio. Simple ROI compares returns to costs by making a ratio of cash inflows to outflows that follow from the investment. Thus, the ROI ratio is by definition "net investment gains over total investment costs." Analysts usually present the ROI ratio as a percentage. When the metric calculates as ROI = 0.24, for instance, the analyst probably reports ROI = 24.0%. A positive result such as ROI = 24.0% means that returns exceed costs. Analysts, therefore, consider the investment a net gain. The opposite kind of result, negative ROI results such as –12.7%, means that costs outweigh returns. Analyst, therefore, view the investment as a net loss. Consequently, when comparing two or more investments—and when risks and other factors are equal—the investment with the higher ROI is the preferred choice. ROI has become popular in the last few decades as a general purpose metric for rating capital purchases, projects, programs, and initiatives, and also investments in stock shares and the use of venture capital. Because ROI is popular and widely used, however, decision-makers and analysts should remember that many who produce ROI figures have a poor grasp of the metric's weaknesses and unique data needs. With ROI figures from an unknown source, therefore, the wise decision maker will also ask to see the source data for those results. Some analysts say that "simple" ROI measures profitability. While that statement is accurate and useful, other businesspeople borrow a term from the field of economics and claim that ROI means efficiency. That usage is arguably less helpful because many people use the same word—"efficiency"—to describe the meaning of quite a few other metrics, including the Internal rate of return IRR, payback period, inventory turns, and return on capital employed (ROCE). The essential meaning of the ROI concept. Calculating ROI for decision support and planning purposes. ROI for comparing competing proposals. Guidance on when to use and not use ROI. ROI input data: Discounted vs. non-discounted cash flow. ROI for business case scenarios. Comparing ROI to other cash flow metrics, including NPV, IRR, and Payback Period. What is the "return on investment" ROI? What does the return on investment concept mean? How do you calculate ROI for decision support and investment analysis? How does ROI compare competing choices and different cash flow streams? In conclusion, when and where should you use the return on investment ROI metric? When should you avoid using ROI? Should you calculate ROI from discounted cash flow (present value) figures? Can ROI results appear alongside other metrics such as net cash flow, future performance, payback, NPV, and IRR? How do you use ROI to evaluate business case scenarios? Which other financial metrics are also called ROI? ROI due to cash and capital portions of larger transactions: see Cash on cash. Measuring the value of professional training: see Return on investment for training. ROI due to company earnings from capital assets and equity: see Profitability. The name of the return on investment metric describes its meaning. It is not surprising, therefore, that businesspeople use ROI to address questions like these: "What do we receive for what we spend?" And, "Do expected returns outweigh the costs? Also, "Do the returns justify the costs?" And, finally, "What is the profitability of the investment?" The simple ROI metric answers these questions by making a ratio (or percentage), showing the size of net gains relative to the size of total costs directly. Consequently, when total returns exceed total costs, net gains are positive, and the ROI metric is positive (greater than 0). The opposite outcome (negative net gains) leads to a negative ROI (less than 0). A negative ROI means, therefore, that total costs outweigh total returns and the investment is a net loss. Thus, for example, a result of ROI = 10%, says that returns exceed costs by 10%. And, with a 10% ROI, the investor can rightly say "the action earned 10% on costs," and that "profitability was 10%." In the same way, an ROI of -10% says that earnings and profitability were negative. As a result, when different proposals compete for funds, and when other factors between them are truly equal, decision-makers view the option with the higher ROI as a better choice. Decision-makers should know that ROI figures alone are not a sufficient basis for choosing one action over another. That is because ROI shows how returns compare to costs only if the hoped-for results arrive.The ROI figure, therefore, shows expected profitability but says nothing about uncertainty or risk. Consequently, the wise analyst also estimates the likelihood of different ROI outcomes, and wise decision-makers always consider both the size of the metric and the risks that come with it. 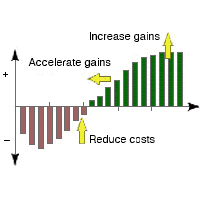 Decision-makers will probably expect the analyst to produce ROI figures and also measures of risk, of course, but they will also expect practical advice on ways to improve return on investment by reducing costs, growing income, and moving gains forward in time (as the arrows in the figure above suggest). Analysts usually present return on investment as the return (net gain) due to an action divided by the cost of the act. That is the simple ROI version of the cash flow metric for rating investments, business case results, and other actions. What is the ROI for a marketing program that will cost $500,000 and deliver an additional $700,000 in profits over the next five years? The return on investment formula seems simple, but usage is not always as straightforward as it looks. The real challenge in finding ROI for any investment or action is knowing which costs and which return figures to use in the formula. Note especially: Results such as the 40.0% figure above mean something only when both the gains and the costs are undoubtedly due to the action, and are not due in part to other causes. In complicated business settings, however, it is not always easy to match specific returns (such as greater profits) with the specific costs that bring them (such as the costs of a marketing program). As a result, when the match between "returns" and "costs" is doubtful, the ROI metric loses validity as a guide for decision support. ROI validity also suffers when the cost figures include allocations or indirect costs, which are probably not due to the action. Sections immediately below show how ROI metrics compare two investment cases that are competing for funding. Comparisons of this kind turn up when decision-makers must prioritize incoming proposals to choose those that will justify their costs. At the same time, they will deny funding to those that will probably bring smaller returns or even a net loss. As a result, Capital Review Committees, Project Management Officers, strategic planners, and others, routinely turn to metrics that take an "investment view," of proposed actions. When using ROI to compare two proposals, other things being equal, decision-makers will probably choose the option with the higher ROI. Notice two features of these cash flow streams that are apparent at once. Firstly, Case Alpha has the higher overall net cash flow over five years: Alpha's total net cash flow of $140 is higher than Beta's figure of $120. Secondly, however, cash flow timing in the two cases is entirely different. Beta seems to be "front-loaded," which means that more substantial returns come in the earlier years. As a result, the analyst will want to know how the timing differences impact several different cash flow metrics. As a rule, decision-makers usually consider several financial metrics, not just one, when making important decisions. Consequently, to answer the question, "Which is the better business decision?," the analyst will probably review both cash flow streams with a set of metrics such as ROI, NPV, IRR, and Payback period. Examples below will show, by the way, that Alpha's cash flow stream has a problem that is hidden by the net cash flow figures. Among these metrics, only ROI reveals this problem. Later sections show that ROI's unique insight has to do with the difference between profits and profitability. To produce simple ROI, the analyst must have cash inflow and cash outflow data for each period, not just net cash flow values. The data tables above, therefore, must add columns with these figures, as well. Thus, with inflows and outflows now in the first two columns, the tables suffice for producing proper ROIs. Decision-makers should note especially, however, that metrics built from these numbers are "proper"—have clear meaning—only if the analyst confirms that these cash flows are due to the investment or action, and not to other causes. The example shows ROI calculations for case Beta at the end of Year 3. Note especially: that individual cash outflows (costs) for Years 0-3 appear both above the line and below the line, while cash inflows for Years 0-3 appear only above the line. As a result, annual net cash flow figures alone do not suffice for producing ROIs. They are not sufficient because they hide the component inflows and outflows. In ROI Terms, Which Choice is the Better Business Decision? Using simple ROI as the sole decision criterion, which choice, Alpha or Beta, is the better business decision? The question equates to asking "Which case has the better returns compared to costs?" Comparing 3-year results from each case, Case Beta's 35.9% ROI is greater Alpha's ROI of –3.1%. As a result, when other factors are equal, Beta is the better business decision for a 3-year investment. Consider 5-year results, Case Beta still has the higher ROI of 51.1%, while Alpha's 5-year ROI is less, at 29.5%. Consequently, when other factors are equal, Beta is also the better business decision when the 5-year investment life is in view. In brief, the return on investment metric shows a significant advantage for Beta, even though Alpha has the greater 5-year net cash flow ($140 vs. $120). Why? Note especially that simple ROI derives from periodic inflows and outflows, not from net cash flows. Alpha has more substantial inflows and outflows. Compared to Alpha, Beta's inflows and outflows are smaller. As a result, Alpha brings in higher profits than Beta, even though Beta is more profitable than Alpha>. Return on investment reveals that difference. NPV, IRR, and Payback metrics are blind to that distinction because they derive from net cash flow figures. The differences between profits and profitability can be significant for several reasons, which means, therefore, that some analysts consider an ROI figure mandatory for every investment review. Option Alpha may become less attractive in the investor's eyes, for instance, because he or she must first budget and pay for Alpha's more substantial total costs, no matter how large the incoming returns. As a result, the business decision maker may be unwilling or unable to do so. When and Where Should You Use ROI? Should we make this investment, "Yes" or "No"? Does the investment bring a net gain or a net loss? What is the profitability of this investment? In other words, what is its return on investment? Which of several competing actions is the most profitable? And, which option should we choose? Also, however, it is important to remember to use ROI only when the appropriate cash flow data for calculating the metric are available. In brief, this means that ROI is legitimate only when all investment costs (cash outflows) and all returns (cash inflows) are known. Return on investment can evaluate straightforward investment situations with only one cash outflow and one cash inflow. More often, however, return on investment applies to investment scenarios with multiple cash inflows and outflows across a longer investment life. What is the return on investment for a gambler's winning bet on a horse race? IIn this example, just before the race, the gambler places a $10 bet on horse #4 to win. Then, a few minutes later, horse #4 finishes first. The pay off for a winning bet depends of course on the "odds" in effect when betting windows close. The resulting ROI, therefore, also depends on the betting odds and the bettor can say, correctly, that these odds are the same as the ROI for this bet. Suppose in this case the winning bet pays $24. As a result, ROI is 240% for this single investment. There is one cash outflow (the $10 bet) and one cash inflow (the $24 pay off). Both events are due to the investment, and the ROI meaning is therefore valid. Note especially that the "two-event " metric result does not take into account the timespan between outflow and inflow. Remember also that ROI itself is also unconcerned with investment risks or the advisability of making such an investment. What is the ROI on a non-coupon-paying bond purchase? What is the ROI on a work of art, purchased as an investment? Note that the two-event model assumes there are no necessary owner costs besides the single purchase cost. Complex Actions: Multiple Cash Inflows and Outflows over Extended Time Period. In business, the return on investment metric more often applies to actions that bring many cash flow events across many years. Case Alpha and Case Beta above are examples of the multi-event, multi-year ROI. Here, unlike the simple two-event case, the analyst must, therefore, know the length of investment life. Specifying the lifespan is necessary because this lifespan determines which data go into the ROI ratio. For the multi-event, multi-year case, therefore, all that the analyst needs the following to calculate return on investment. For Case Alpha, the 5-year inflow sum is $615, and the 5-year outflow sum is $475. As a result, the Case Alpha metric calculates as 29.5%. What is the ROI for a college education? Is there a positive ROI for professional training? Will the marketing program show a positive ROI? What is the ROI for buying a restaurant business? Analysts sometimes provide ROI figures when the ROI metric is not appropriate. Consequently, it is helpful to point out some few everyday situations where the analyst should refrain from using simple ROI. Avoid ROI When Cash Inflow and Outflow Figures Are Not Available. Analysts sometimes approach a cash flow stream starting with "Net cash flow" figures for each period. The Alpha and Beta examples show, however, that net cash flow figures alone do not reveal true profitability (simple ROI) for an investment. To build a proper ROI ratio, therefore, the analyst must uncover the underlying inflows and outflows. Nevertheless, some people, produce ROI figures anyway, using the negative net cash flows as "costs" and the positive net cash flows as "returns." As a result, the meaning of those ROIs is unclear. Avoid Simple ROI When Comparing Investments for Different Periods. A four-year ROI for one action does not compare appropriately to a seven-year ROI for another investment. Remember the advice, "Other things being equal, the better choice is the option with the higher ROI." However, when comparing metrics for investments or actions with different time periods, "Other things" are not equal. Consequently, ROIs for different periods do not compare directly. Avoid ROI When You Do Not Know That Cash Inflow and Outflow figures Are Due to the Investment, Only. What is the return on investment for a marketing program? It may be relatively easy to measure costs due exclusively to the program. However, in a situation where gains such as "greater sales" or "increased profits" no doubt result from many actions besides the marketing program, it is therefore difficult to measure the portion of those returns actually due to the program. Which business case scenario has the better return on investment? Should You Calculate ROI From Discounted Cash Flow PV Figures? Some people in business produce ROI metrics from discounted cash flow figure, that is, from inflow and outflow present values (PVs). This approach presents few computational problems because once you have the "present value" for each cash inflow and outflow, finding the metric itself is as simple as building ROI from non-discounted cash flow figures. Nevertheless, while the ROI math may be simple, interpreting PV-based ROIs can be more difficult. As a result, many businesspeople cannot explain the meaning or proper use of ROI when the metric results from PV figures. Consequently, the PV-based metric appears rarely. To compute a PV-based ROI, consider these cash flow figures for Case Alpha. 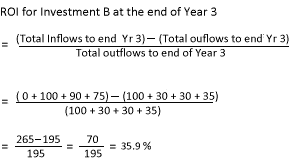 The present value PV for each inflow and outflow represents end-of-period discounting and a discount rate of 8.0% (see the article Discounted Cash Flow for more on PVs). As a result, under the PV-based approach, ROI derives from the sum of the inflow PVs (480) and the total for outflow PVs (398). Consequently, the PV-based 5-year return on investment for Case Alpha is 21.1%. Alpha ROI = 29.5% from non-discounted figures. Using similar PV figures for Case Beta above, the sum of Beta inflow PVs is 293, while Beta outflow PVs total 210. As a result, the Case Beta ROIpv is 39.5%. Beta ROI = 51.1% from non-discounted figures. Note, especially, that both PV-based metrics are lower than the same ROIs based on non-discounted cash flow figures. Understanding the reasons for these differences, therefore, is key to understanding what PV-based ROI says about investment cash flow streams. The PV-based metric can turn out to be either greater or less than ROI from figures non-discounted data. The reason is that the greater discounting impact can fall either on the cash flow costs (outflows) or the cash flow returns (inflows). In cases where more considerable costs come early, and more substantial gains come later, discounting lowers ROI. That is because the discount effect is higher on the late-arriving benefits, while the discounting impact is less for the earlier and more substantial costs. For investments or actions where the more significant costs come later, and more substantial gains arrive early, discounting has the opposite effect, that is, discounting raises ROI. That is because, in this case, the discount effect is more significant for the late-arriving costs, while the impact is less for the substantial gains that arrive early. Alpha and Beta both have "investment curve" profiles because, in both cases, larger costs come early and larger returns come later. As a result, both cases have a PV-based ROI that is less than the ROI from non-discounted cash flows. In such cases, the investor can therefore properly say that ROI becomes more conservative, or more pessimistic when "investment curve" ROIs derive from PV data. Notice especially, that the size of the discounting impact differs between Alpha and Beta. The discounting effect on Alpha is high while the discounting result on Beta is low. Changing to the PV approach reduces Alpha's ROI by 28.5% (from ROI = 29.5% to ROI = 21.1%), while the same change lowers Beta's ROI by 22.7% (from ROI=51.1 to ROI=39.5%). An earlier Case Alpha example stated that the "ROI result for the entire investment life is blind to the timing of inflows and outflows within the investment life." Note especially, however, that statement does not apply to PV-based ROI because the size of the discounting effect is indeed sensitive to cash flow timing. To some analysts, the examples above show how the PV based approach adds useful information to the ROI figures, while to others, the same examples show how PV-data confuse the metric's meaning. And, to many businesspeople, the discussion about front loaded and backloaded cash flow streams no doubt seems "theoretical," probably having little practical value for those making real-world investment decisions or for business planning. Therefore, In the interest of clarity and a meaning that is easily understood, many business analysts, investors, and decision-makers decide that bringing PV-based cash flow into the ROI picture "muddies the waters." Consequently, many prefer to avoid discounted data when using ROI, while leaving time-value-of-money concepts to the metrics meant explicitly to handle them: net present value NPV and internal rate of return IRR. Analysts and decision-makers are free, of course, to use or not use PV-based data for ROI, as they wish. However, those who prefer PV-based ROI's should be sure that everyone involved understands how the ROIs are derived and also how to interpret the discounting effects. Decision-makers and investors turn to ROI and other cash flow metrics such as NPV, IRR, and Payback to address questions like these: "What is investment profitability." And, Do the returns justify the costs? And, "What do we get back for what we spend?" In other words, they turn to metrics that take an "investment view" of an action or investment. Note that several different financial metrics besides ROI serve this purpose. These "Investment View" metrics all compare the timing and sizes of returns and costs. Each investment metric (ROI, IRR, NPV, and Payback Period) has a different way to approach this task and, and as a result, each carries a unique message about the nature of the cash flow stream. At the same time, however, each of these metrics is blind to particular characteristics of the cash flow streams— features that other financial metrics do see. And, also note, that the different "metrics" can disagree on which of the investments is the better business decision. Just one financial metric should not decide critical decisions. When different metrics disagree as to which option is the better choice, decision-makers must examine the current financial situation to decide which to follow.. The different natures of Alpha and Beta results also stand out in the cumulative cash flow graph, below. "Cumulative cash flow" for a period is the sum of all net cash flows through the end of the period, the fourth data column in the tables above. (For more on "cumulative cash flow" and payback, see the articles Cash Flow and Payback Period.) Note especially that some people refer to cash flow graphs such as these as "return on investment curves." Cumulative cash flow curves for the net cash flow figures for Case Alpha and Case Beta. It is not possible to estimate simple ROI from these curves because they represent net cash flow figures, not the cash inflows or cash outflows that make up the net results. Which case, Alpha or Beta, is the better business decision? The analysis shows that each case has points in its favor, compared to the other, and decision-makers must, therefore, weigh ROI results along with several different metrics to decide which is the best choice for them. When comparing cash flow streams like these, the analyst no doubt turns first of all to the financial metric total net cash flow. For a 5-year period, Alpha's cash flow total is higher at $140, while Beta's cash flow is less, at $120. Hence, Case Alpha outscores Beta on the total net cash flow metric. Therefore, the analyst can say that Alpha has higher profits. Future performance is not a financial metric, per se, but while reviewing total net cash flow, an astute analyst will notice that the two cumulative cash flow curves point to very different results for the years after year five. Notice especially that by Year 5, Alpha's cumulative curve is growing at a rapidly increasing rate while Beta's growth seems to be leveling off. If both investments have no impacts after year 5, of course, there will be no "future performance to consider." However, If the analyst believes these investment patterns will continue, Alpha, therefore, scores higher than Beta regarding likely future results. Among the financial metrics, the analyst will probably turn secondly to the simple ROI figures for each case. Note especially that Beta's 5-year ROI is higher at 51.1% while Alpha's is less, at 29.5%. Therefore, Beta scores higher than Alpha with the ROI metric. As a result, the analyst may choose to report that Beta scores higher in profitability. The analyst may also note that Beta shows greater profitability at every year-end over the five-year period. Analysts prefer the shorter payback period because it means they recover cost expenditures sooner, and these funds are ready for use again, sooner. Analysts consider a shorter payback period less risky than a more extended payback period. Regarding the payback period, therefore, Case Beta scores higher than Case Alpha. When cash flow returns and costs extend two years or more into the future, almost all analysts will want to compare cash flow streams with the net present value (NPV) metric. Using a 10% discount rate, Beta has a higher NPV of $76.18, while Alpha's NPV is less, at $70.51. Consequently, under the time value of money rationale, Case Beta is worth more, today, than Alpha, even though Alpha will return more funds after five years. Case Beta, therefore, outscores case Alpha regarding the NPV metric. Finally, in some settings, analysts will compare cash flow streams regarding the internal rate of return metric. The Internal rate of return (IRR) is the interest rate that produces an NPV of 0 for a cash flow stream. In reality, not many people in business are prepared to explain IRR figures in a way that makes practical sense for decision-makers and investors. Nevertheless, financial officers in some industries (such as financial services or insurance) rely on the metric for decision support. (See the article Internal rate of return for more on IRR, problems with IRR usage, and a recommended alternative, modified internal rate of return MIRR). Here, Case Alpha has the lower IRR rate, at 28.9% while Beta's IRR is higher at 44.9%. Financial officers usually view an investment with an IRR above their cost of capital as a net gain and, here, both cases show IRR well above any company's cost of capital. However, when proposals compete for funds, and when other factors are equal, decision makers prefer the submission with the higher IRR. In conclusion, case Beta has the advantage regarding IRR. Green cells hold the better outcome for each financial metric. Which business case scenario should the analyst recommend? Does the business case justify funding the proposal? ROI and other cash flow metrics (NPV, IRR, and Payback) often play a role in addressing such questions. The business case looks forward in time, projecting cash inflows (benefits) and cash outflows (costs) under two or more scenarios. Firstly, one scenario will represent the proposed action or investment. Secondly, however, cases include a "Baseline" or "Business as usual" scenario. Note that the Baseline scenario projects results for the same cost and benefit items without taking the proposed action. Consequently, the Baseline lets the analyst measure changes (from Baseline) that would follow from implementing the Proposal scenario. When the analyst has two "full value" scenario cash flow statements (one for the Proposal scenario and another for the Baseline Business as usual), the analyst also builds an incremental cash flow statement. Figures in this statement represent the differences between the same cash flow items in the two full value scenarios, hence the term "incremental." As a result, the incremental cash flow values represent only cash flows due to the action or investment. These values are therefore legitimate data for finding scenario ROIs. For more on business case cash flow, see Business Case Cash Flow Statement. Also, for ROI examples with business case cash flow, see Business Case Essentials. Which Other Metrics Also Carry the Name Return on Investment ROI? Also, the term some people refer to cumulative cash flow results over time as a "return on Investment curve." Also, some people call still other cash flow metrics "return on investment," such as the Average Rate of Return and even Internal Rate of Return IRR. In conclusion, several different "ROI" metrics commonly used. And, the term itself does not have a single meaning that everyone in business understands in the same way. Therefore, when using return on investment figures, it is good practice to be sure that everyone involved understands precisely which version of the metric is in view.